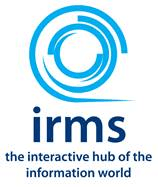 ‘Welcome to the Wild Wild West of Wales’ was the theme of the opening evening of the Information and Records Management Society (IRMS) Conference 2015, held from 17th – 19th May. As well as reflecting the new Welsh location of the Conference for 2015, at the rather spectacular Celtic Manor Resort – a change of scene from the Conference’s usual residence at the Hilton Metropole Brighton – this (rather tongue-in-cheek) theme of the opening night resonated with the broader purpose of the Conference: to explore the reality that information professionals are working at the frontiers of cutting-edge new advances of understanding around the uses of information, records and data. The emphasis was on dialogue, learning and discovery around what this means for our sector, our society, our world – even human progress at large. I was lucky enough to attend the full conference courtesy of the Society, being this year’s recipient of the Alison North Award for New Professionals. 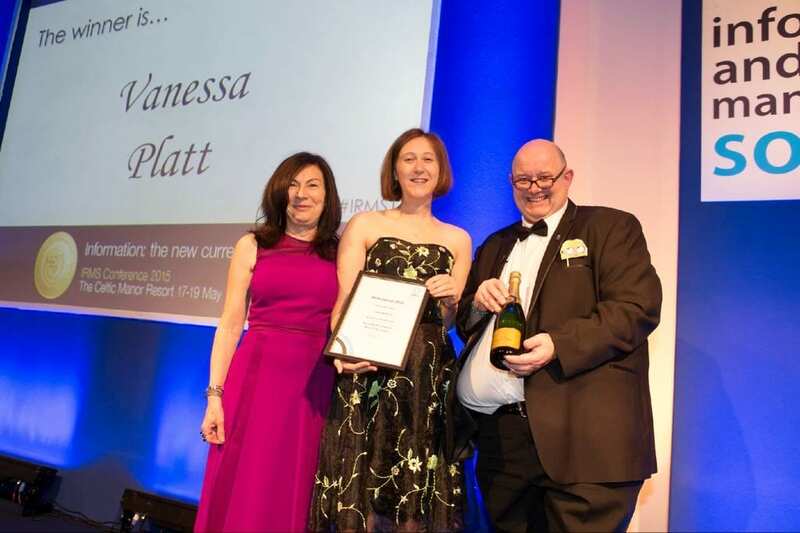 The prize – full conference attendance and the opportunity for mentoring time with RM author, consultant and award sponsor Alison North – is awarded annually for the best essay submitted by someone in the first 3 years of their career in the sector, based on a reflection on their information and records management experience. 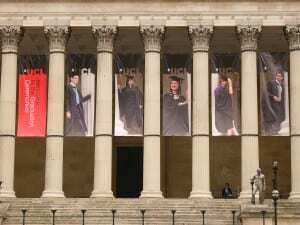 Before I began my Archives and Records Management MA with UCL, I spent some time working in public sector records management, in a large professional team with an advanced electronic document and records management system (EDRMS) in place. This RM programme, like countless others, makes heavy use of a network of 250+ non-professional office staff, trained to assist their colleagues with information management matters and to administer their local area of the EDRMS. This arrangement struck me as less than ideal, especially as this additional role was not voluntary, not salaried, and on top of an employee’s daily work (as is invariably the case elsewhere), and my entry to the Award was a critique of this element of so many business-as-usual RM programmes. I feel that there are better ways of encouraging end-user buy-in and take-up that keeps records management systems as a help, rather than a hindrance, for all users. Alison North (far left) and IRMS Chair Meic Pierce Owen (far right). Consistent with the intrepid theme of that first evening, and indeed of the entire event, this conference was a new experience for me. Such an opportunity to meet, network and engage with experienced professional colleagues is truly irreplaceable, and I learnt a great deal not only about the enormous value (in every sense of the word, including fiscal) that can be ascribed to the information we create, receive, manage and use, and to our professional endeavour, but also of the huge potential that there is in this sector for interdisciplinary, cross-profession collaboration, dialogue and learning: I heard talks by experts in digital preservation, information architecture, system, software and storage developers, international business, asset management and information compliance, as well as from the Deputy Director of the US Department of Navy’s division for records management – a speaker who generated a lot of audience interest. The official theme of the conference was ‘Information: the new currency’, and this bold statement elicited strong responses in disagreement as well as in agreement – as I am sure it was intended to. In the breakout sessions I attended, there were memorable arguments both for and against, from both practical and theoretical perspectives. Jon Garde from RSD (an international Information Governance solutions developer) proposed information as actual currency, something to which we ascribe value as a medium of exchange, with a fluctuating market value in business, using ideas from Infonomics (Information + Economics). He closed by suggesting that the Information Managers of the future will be the ‘Information Accountants’ of businesses. At the opposite end of the spectrum of information value, Alan Bell from Information Compliance at Dundee University posited that information today is so ubiquitous, it is not a currency at all, but rather a commodity. He drew on the thinking of UCL’s own Geoffrey Yeo in exploring the nature of recorded information, as well as managing to weave Elvis and Fifty Shades of Grey (or was it Records Management…?) into his talk. I took away from these contrasting viewpoints that ‘information’ today remains malleable and context-bound in nature and value, as well as in form, and that this malleability poses questions as well as opportunities for all of us. Does information decrease in value to us because there is more of it, or does it rather increase in value? For me, it is the very volatility information’s value today that presents us with the greatest opportunities in human history, as well as, arguably, the greatest risks. The IRMS Conference 2015 was altogether a superb experience, and will remain a landmark in my career. My thanks must go to the fantastic IRMS Exec, who made me so welcome and the event so memorable. I also thank the Archives and Records Management programme staff here, who brought the award to my attention and whose excellent guidance and teaching over the last year has encouraged me to see that a new professional such as myself can – and should – share my thoughts with the wider profession. Everyone has something to offer, perhaps now more than ever. 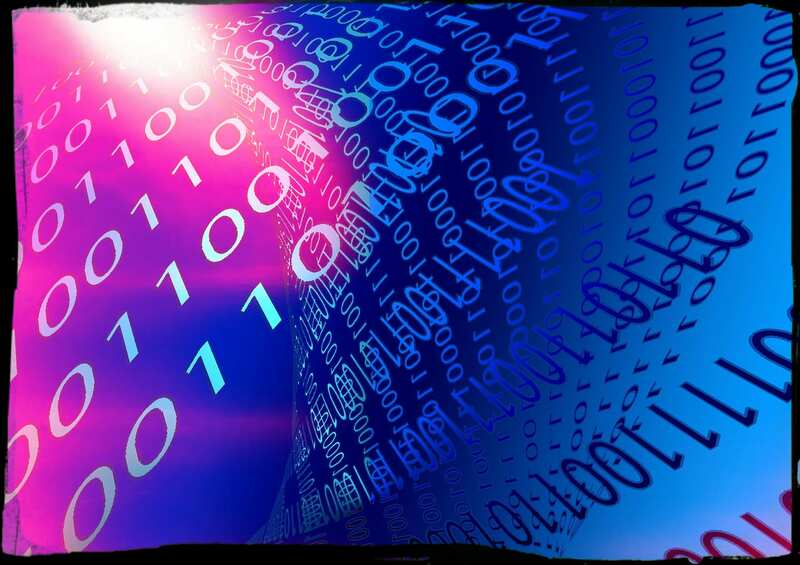 It is a challenging but certainly exciting time to be an Information and Records Management professional. I should also say that the Wild West-themed opening evening did not disappoint: a rooftop garden barbeque was accompanied by highly appropriate entertainment – I will always bear in mind that a Bucking Bronco acts as an excellent ice-breaker! 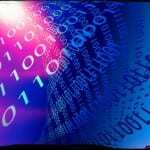 Indexing and abstracting databases are key to producing good, robust research but they can be daunting and confusing and it is tempting to stick with the familiarity of Google and Google Scholar. To get some advice on searches for your assignments, come along to a search skills surgery, where you can pick up some tips and develop your confidence in using A&I databases. This is a drop in session so come along at any time within the hour, armed with any troublesome searches and questions you have. LISA – Index of journal articles in librarianship and information science, including archives and records management, publishing and some material relating to Digital Humanities. Includes abstracts from over 440 periodicals from more than 68 countries and in more than 20 different languages. Library and Information Science Source – Content includes full text for more than 460 publications and indexing for hundreds of high-quality journals, as well as books, research reports and proceedings. Subject coverage encompasses librarianship, classification, cataloging, bibliometrics, online information retrieval, information management and more. INSPEC – a bibliographic information database covering the fields of physics, electronics, computing, control engineering and information technology with more than 7.7 million records taken from 3,500 technical and scientific journals and 1,500 conference proceedings. SCOPUS – multi-disciplinary database containing references to journal articles, conference proceedings, trade publications, book series and web resources. If you can’t make this session please feel free to drop me an email with your queries. The surgery will run as a drop in session so come along at any time within the hour, armed with any troublesome searches and questions you have. Looking forward to seeing you there! If you can’t make either of these surgeries, please feel free to drop me an email with your queries. 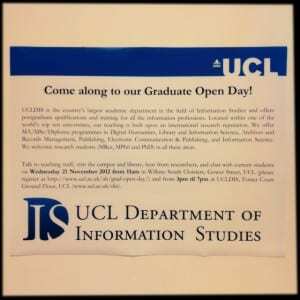 UCL DIS (Department of Information Studies) is gathering information about its alumni, including former students of SLAIS (School of Library, Archives, and Information Studies – we changed our name in January 2009). If you’re one of our alumni then we’d like to know what you’re up to now. Please can you tell us if you’re working, volunteering, studying or doing something else? What organisation are you at? What do you do? Where in the world are you? 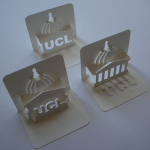 You can comment on this post if you like, with your name, email address and details, or if you’d prefer to send us an email please do at: l.keshav@ucl.ac.uk. Don’t worry, we’re not going to share this information with anyone without your permission, and if we use it to produce data on UCL DIS/SLAIS alumni it will not be linked to you as an individual. We may contact you again to ask if we can use you as a case study for our website but we will not do so unless you have expressly agreed to this. Please help us spread the word and reach as many alumni as possible by passing this on to other alumni you’re in touch with, and sharing the link on Facebook and Twitter. If you are a current student or one of our alumni (dating back to our time as the School of Library, Archive and Information Studies) and have professional news to share, we’d love to hear from you. 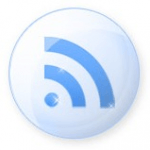 Find out how to contribute on our “About” page. Image: elod beregszaszi, copyright commons, some rights reserved. Originally posted by Dr. Jenny Bunn to the UCL Staff Blog. Every year students on the Department’s archives and records management programmes spend two weeks on work placement undertaking cataloguing projects in a variety of archival institutions. These institutions tend to be based within London and the South East, but this year two students, Sharon Messenger and Ego Ahaiwe, have taken the bold step of travelling much further afield. Sharon, for example, has just spent two weeks in the Orkney Library & Archive in Kirkwall and you can read more about her experience there on the Orkney Archive blog. Then again, Ego has travelled across the Atlantic to the Immigration History Research Center based in the College of Liberal Arts at the University of Minnesota, where she became headline news. We therefore welcome back Ego, Sharon, and all our students from their travels and send a huge thank you to all those institutions who have kindly hosted a placement this year! Slideshow of images and comments by students who attended last week’s visit to the Bibliography Room. This was an optional field trip for the MA LIS, MA ARM and MA RAMI students who took Historical Bibliography (INSTG012) this year. From September 2011, it will be an option for the new MA Digital Humanities. There is a full, reflective post on the UCLDH blog. Jenny Bunn has been appointed to a one-year Teaching Fellow post which will support the additional student numbers on the MA ARM and RAMI programmes. Jenny has worked as an archivist at the National Archives and in several banking and specialist archive services. She will be teaching archival description, principles of archives and records management and an option in digital description. Jenny is currently in the writing up phase of her PhD.